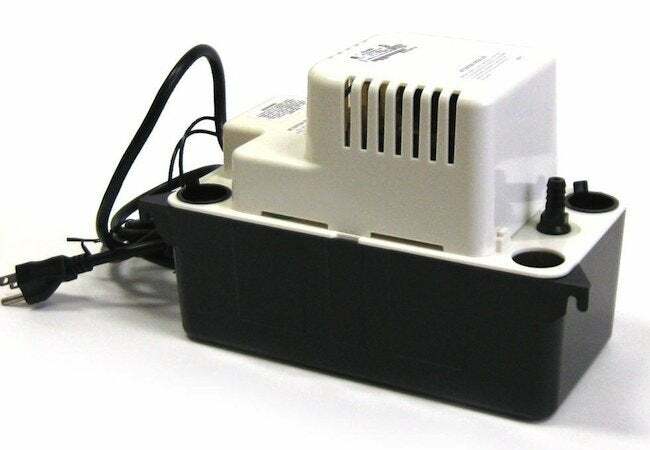 Installing a condensate pump is a no-brainer for homeowners tired of seeing water pool around their HVAC components. Here's how it's done. High-efficiency heating and air conditioning systems produce condensation, and that condensation needs to go somewhere besides your basement floor. If you have a floor drain near the unit, just use plastic tubing and good old gravity to get the water from the outlet port of your unit to the drain. If you don’t have a drain nearby, you may need a condensate pump to get the water to a drain. That’s especially true if the drain is higher than the outlet port. Once you’ve located the outlet port where the water exits your unit, attach PVC pipe to route the water from there down into the condensate pump (which will need to be lower than the outlet port). Then attach plastic tubing—one end to the exit port of the condensate pump, the other to the drain. Be sure to check the pump periodically to make sure it’s operating as it should.